Hondurans consider themselves to be proverbially calm. When asked how they are doing, they will most likely answer a laconic “tranquilo.” They consciously distance themselves from their rebellious Nicaraguan and industrious El-Salvadorian neighbors. If this is a good indication of the Honduran collective psyche, it might offer an explanation for the traditional absence of the country in the headlines. The military ousting of President Zelaya in his pajamas on the morning of June 28th, however, did make it into the news worldwide. Yet nothing is what meets the eye in Honduras. Despite what would seem a very low “decisiveness parameter”, in the language of economic theory of conflict, Honduras has hosted more than 400 armed uprisings since independence from the Spaniards. In the 1960s, Hondurans and El-Salvadorians brawled into a war that was ignited by their rivalry during the soccer World Cup qualifying round. The hundreds of disappeared civilians in the ‘70s made little dent on the Hondurans’ trust in the military, second only to their faith in the Church, as reported year in and out by Latinobarómetro opinion polls. Even though Honduras has lacked a rebel group seeking separatist goals, break-away enclaves or ethnic tensions, several ethnic groups share very little in common, from Miskitos in the sparsely-populated Eastern jungles to English-speaking black Garifunas in the tourist-based wealthy northern islands (once haven of pirates) – in this Central America country of 7.7 million people slightly larger than the state of Tennessee. The country is also the third poorest in Latin America—after only Haiti and Nicaragua—and is abundant in neither high-value mineral nor agricultural natural resources. Yet, the infamous economic abuse and political interference of large fruit transnational corporations during the first quarter of the last century led to the coining of the term “Banana Republic”, later replaced by the “backyard” of the U.S. counter-insurgence operations against Nicaraguan Sandinistas. Adding to these numerous contradictions in Honduran history, the military toppled Mr. Zelaya’s administration just five months before the legal expiration of his term. The military alleges that they simply responded to an indictment by the Supreme Court ruling out Mr Zelaya’s aspirations of a constitutional reform referendum as illegal. In fact, Article 239 of the current 1982 Constitution sanctions a President who instigates the reform of its foundational articles (called pétreos, literally, cast in stone) with separation from public office. These circumstances make the Honduran coup unique as the military overthrew a legally elected President ostensibly on behalf of preserving the constitutional rule of law that was perceived (certainly by the socioeconomic elite) to be threatened by the incumbent government. The military did not seize power for itself, but instead transferred it to the opposition group, which maintained the constitutional rule of law pre-existing the coup. Even though preserving the Constitutional rule of law is certainly a mandate of the armed forces (Article 272 of the Constitution), they incurred unconstitutional acts in Mr. Zelaya’s overthrow: Article 102 indicates that a Honduran citizen cannot be extradited or handed over to a foreign State; Article 278 explicitly indicates that the armed forces must obey President’s commands; Article 375 states that those violating the Constitution ought to be tried under the Constitution and incumbent laws. In any event, this is clearly different from the last century’s assiduous military coups, grabbing power and changing the Constitutional order, as well as from recurrent popular protests forcing the incumbent President out of office observed in Latin America since the ’90s. In contrast, the Honduran coup took place in order to maintain a threatened—or so it was perceived­—status quo. The military was the executing instrument but not its direct beneficiary. In hindsight, Mr. Zelaya’s attempts to reform the Constitution via summoning a new Constitutional Assembly that would potentially pave his way for re-election, were inexorably what took him out of office. Why then Mr. Zelaya’s insistence? Some analysts point to the erratic, impulsive and confrontational character of Mr. Zelaya, which would have magnified the large discount rates into the future and short planning horizons that politicians are typically bestowed with. A Chilean analyst, Angel Saldomando, puts forward another view—not inconsistent with the former—stressing Mr. Zelaya’s incapacity to generate minimum political consensus. That inability led him to a disproportionate personalist and antagonist behavior, in which the consultation of the constitutional reform was a question of life-or-death. However truthful, these are opportunistic explanations of the Honduran coup. A longer term perspective is in order, going back at least to 1981, when Honduras returned to democratic rule after years of intermittent military dictatorships. Since then, seven elections have been held periodically every four years, with four transitions of power between the two major parties, Liberal and National, both widely considered conservative. The 1982 Constitution precludes Presidents from seeking re-election, either for consecutive or non-consecutive terms. However, more than twenty five years later, analysts consider the Honduran democracy to be far from fully developed, engaged instead in a continuous partisan uncooperative electoral-like state; overridden by rent-seeking and clientelist behavior; and insufficient—albeit increasing—political participation of civil society. By November 2005, Mr. Zelaya unexpectedly won the Presidential election with 46 percent of the total vote. His subsequent years in office were marked by international oil, food, and financial crises, exacerbating the country structural economic problems (declining labor productivity; no diversification strategies; scarce reform progress) and political troubles (corruption, reform paralysis, and insecurity). The poverty reduction strategy that had guided policy making in the previous two administrations—but seen by many as an imposition of a neoliberal international community—was moved out the limelight. In a 360 degree shift, Mr. Zelaya turned his initial conservative ideological position towards leftish positions, adhering in August 2008 to the left-wing coalition of ALBA, the Bolivarian Alternative for the Americas, with Venezuela as its powerhouse. That shift generated fear and uncertainty in a significant section of the Honduran society, which was further alarmed when, eight months before elections, Mr. Zelaya announced his intention to call a new constitutional assembly referendum coinciding with the November elections day that would possibly revoke the prohibition of re-election. Congress, the political establishment (including his own party), and the judiciary (both Supreme Court and Supreme Electoral Tribunal) all declared the referendum illegal in June 2009. 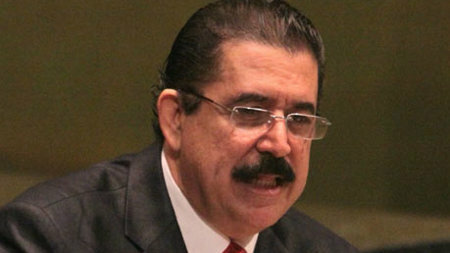 Mr. Zelaya replied by organizing a popular consultation (to be held on June 28, 2009) on the need to summon the constitutional assembly referendum. The military publicly warned the President of the dire consequences of his plans. After that, Mr. Zelaya removed the Armed Forces General in Chief, General Vasquez. The day after, June 27, 2009, Mr. Zelaya headed for an air force base accompanied by a horde of supporters to recover the electoral material for the popular consultation that had been seized hours before by the air force. The following morning, the military arrested and ousted the President to Costa Rica. Since then, Mr. Zelaya has symbolically participated in institutional meetings by a sympathetic international—mainly Latin American—community such as ALBA and UNASUR (Union of South American Nations, in English) summits and the American States Organization, OAS, sessions. OAS’s initial endeavors to restore the ousted president failed, seen by many as the workings of a lop-sided leftish ideological position driving OAS actions. Prof. José Cuesta is an Affiliated Professor at the Georgetown Institute of Public Policies, Georgetown University, Previously, he was a Professor of Development Economics at the Institute of Social Studies, The Hague, and a Research Economist for UNDP Honduras. His research interests include conflict economics, poverty, social policies and intra-household allocation. He has published numerous articles on those topics in Review of Income and Wealth, Applied Economics, Journal of International Development, Journal of Latin American Studies, Development Policy Review, Journal of the Asia Pacific Economies, European Journal of Development Research, Journal of Income Distribution, Revista de Economia Mundial, among others, and numerous contributions in edited volumes, the last one a chapter on social capital, crime and welfare in M. Cox, ed., (2009) “Social Capital and Peace Building”, Routledge Studies in Peace and Conflict Resolution. He is currently working on the relationship between democratization and conflict in Latin America. He holds a PhD in Economics and MSc in Development Economics at Oxford University and a BSc in Economics at Universidad Carlos III, Spain.